Rupert Harner was embedded with the U.S. Marine Corps. London, England (CNN) -- A British journalist was killed and a second wounded in Afghanistan when the vehicle in which they were traveling struck an improvised explosive device, the Ministry of Defence said Sunday. Rupert Hamer, defense correspondent for the Sunday Mirror newspaper, and photographer Philip Coburn were embedded with the U.S. Marine Corps and were accompanying a patrol near Nawa in southern Afghanistan when the explosion occurred Saturday, the ministry said in a statement. "Despite the best efforts of medics at the scene, Mr. Hamer died of his wounds," the statement said. "Mr. Coburn remains in a serious but stable condition." A U.S. Marine was also killed in the explosion, the ministry said. Five U.S. Marines were seriously wounded. The ministry said earlier Sunday that a member of the Afghan National Army was also killed, but later said no Afghan nationals were killed or wounded. "Both Rupert Hamer and Phil Coburn accompanied me on my most recent trip to Afghanistan," said British Defense Secretary Bob Ainsworth in the statement. "I got to know them well and I was impressed by their hard work and professionalism. My thoughts and deepest sympathies are with the families, friends and colleagues of both men at this extremely distressing time." The Mirror said in a statement that Hamer, 39, and Coburn, 43, had flown to Afghanistan on December 31 for a trip that was to have lasted a month. Hamer is survived by his wife and three children, ages 6, 5 and 19 months, the newspaper said. He had been with the Mirror for 12 years. According to his Mirror blog page, Hamer had covered the British armed forces since 2004 in the Middle East, central Asia, Oman, Bahrain, Iraq and Afghanistan. Coburn has been with the paper for eight years and has previously worked with Hamer in Afghanistan and Iraq, the Mirror said. His previous assignments for the paper have included events in Rwanda and Hurricane Katrina in the United States. "Rupert believed that the only place to report a war was from the front line, and as our defense correspondent he wanted to be embedded with the U.S. Marines at the start of their vital surge into southern Afghanistan," Sunday Mirror Editor Tina Weaver said in the statement. "He was a seasoned, highly regarded and brave journalist who had reported from both Iraq and Afghanistan on many occasions. It was his fifth trip to Afghanistan, and he had forged friendships with a number of the soldiers serving out there." Hamer was affectionately known as "Corporal Hamer" in the Mirror office, Weaver said. "He was a gregarious figure, a wonderful friend who was hugely popular with his colleagues." Coburn, she said, is a consummate journalist "and brilliant photographer ... He and Rupert made a dedicated team, working together around the world, sacrificing personal comfort countless times to record the reality of wars. We wish Phil a speedy recovery and send our warmest wishes to his partner and family." British Prime Minister Gordon Brown said in a statement, "I was deeply saddened by this tragic news, and my heartfelt thoughts and sympathies are with the families, friends and colleagues of Rupert and Philip. Their courage, skill and dedication to reporting from the front line was incredibly important and ensured that the world could see and read about our heroic troops. Their professionalism and commitment to our forces will not be forgotten." In recent weeks, the ministry had worked with Hamer on a special Christmas edition of the Sunday Mirror, containing messages for deployed personnel from their families, Ainsworth said. "The sacrifice of service personnel is well documented and rightly respected, but this news demonstrates the risks also faced by journalists who keep the public informed of events on the front line," he said. 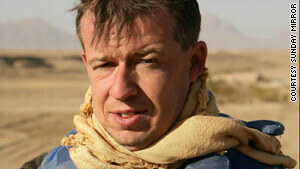 Hamer is the second journalist to die in Afghanistan in recent weeks. On December 30, Calgary Herald reporter Michelle Lang, 34, died along with four Canadian soldiers when a roadside bomb struck their armored vehicle in the southern Afghan province of Kandahar. According to a tally kept by Reporters without Borders, Hamer would be the 20th journalist to die in Afghanistan, and the 12th foreign journalist, since September 11, 2001.